Description: This book offers guidance to security architects and practitioners planning to implement NSX for additional security and visibility through micro-segmentation, providing the information needed to plan a security strategy using NSX. This includes guidance to plan, design, and implement security policy utilizing micro-segmentation. By reading this book, you will find insights and recommendations proven to move an organization from a perimeter-centric security posture to a micro-segmented architecture with enhanced security and visibility within the data center. Description: This book is designed to help organizations understand how to operationalize micro-segmentation in their environments. 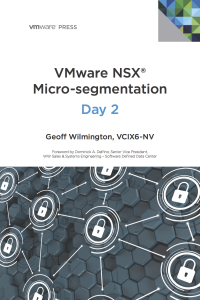 VMware NSX Micro-segmentation – Day 2 is a follow-up to Wade Holmes’s Day 1 guide and provides a primer on leveraging tools (VMware vRealize Log Insight, Application Rule Manager, and VMware vRealize Network Insight) to build rulesets necessary to facilitate micro-segmentation. It’s a fantastic reading to gain the knowledge on how beginning to build a scalable methodology and planning for the applications you are going to secure. 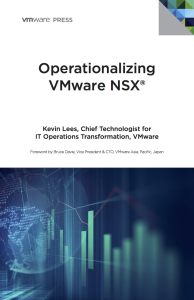 Description: This book offers guidance to management-level decision makers and influencers concerned with the impact of VMware NSX on their organization, staff, and operational processes. The author covers both tactical optimizations – such as tooling for monitoring and troubleshooting, and strategic organization – including team structure, culture, roles, responsibilities, and skillsets. Description: This book introduces PowerNSX to administrators and architects of an NSX environment. PowerNSX is a PowerShell module that abstracts the NSX-v API to a set of easily used PowerShell functions. After some introduction and overview of PowerNSX architecture and functionality, the content focus on PowerNSX usage (such as logical switches creation, distributed firewall configuration, administrative operations, etc.). 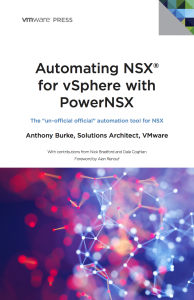 This book can serve as a primer and reference for many day-to-day tasks performed administrators of NSX-v environments. Wow, this is great stuff. I need these books for reading between changing diapers and sleeping Kids! Every title has a download link inclued in every post. @Mona & @Sid, just right-click the book title header and then choose save as. The full book will be downloaded. These are really great books. Thanks for the the awesome books! Are these available in .mobi format? They are not, PDF is the only format available. Hi, the download links are in the article. 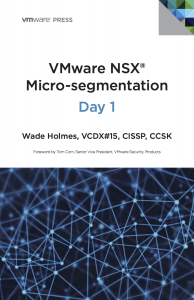 Thanks for sharing, I particularly appreciated the “Operationalizing NSX” one. how to used it? is there any tutorial?